On May 11, 2018, during the period of the first-crop harvest, which is said to produce the most delicious green tea, I visited Tokyo’s nearest premier tea-producing region in the vicinity of the Sayama Hills in western Saitama Prefecture. Centering on the cities of Iruma, Sayama, and Tokorozawa, the Sayama tea-producing region is just a one hour or so train ride from central Tokyo. For tea plants, which like a warm and rainy climate, this is said to be the northernmost economic zone for producing tea in large quantities. First, I visited Iruma, which has the largest area of tea-growing land in the region. There, with the cooperation of the Saitama Prefecture Tea Industry Research Institute and the Iruma City Museum, I learned about Japanese green tea and the characteristics of Sayama tea within the world of Japanese tea. Then, despite the fact that this is the busiest time of the year, a producer in Sayama allowed me to actually see the process of producing first-crop tea (ichibancha). The first place I was taken to by an official of the Saitama prefectural government’s Agriculture and Forestry Division was the Sakurayama observation platform, which offers a panoramic view of Iruma’s tea fields. Down below, the tea fields spread out between the residential housing in the foreground and the Sayama Hills in the distance, their yellowish green color presenting a refreshing sight. The area is certainly not so large—one kilometer from north to south and four kilometers from east to west—but for that very reason, I was told, this region has characteristics and techniques that differ from those of larger tea-producing regions. This comment made me look forward even more to my day’s research ahead. On the way to the Saitama Prefecture Tea Industry Research Institute, by chance we happened to encounter the harvesting of tea leaves. 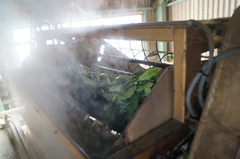 A small riding type tea plucking machine, which has made the task of harvesting much easier since its introduction about 20 years ago, was harvesting the first crop of tea leaves with amazing speed. 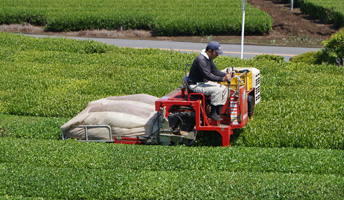 Mounted astride the tea plants, the farmer-driven machine was plucking the new leaves on the surface. 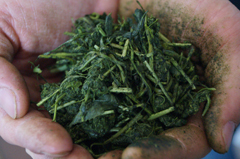 Tea leaves begin oxidizing as soon as they are plucked, so it is a battle against time. After the plucking machine has shaved one row of the tea field, its bag, now full of tea leaves, is immediately put on a truck. And when the truck is full of bags, it takes them without delay to a tea factory. At the Saitama Prefecture Tea Industry Research Institute, I experienced a mock evaluation of Japanese tea (sencha, ordinary green tea made from leaves cultivated in natural sunlight and steamed and rolled after harvesting). There are two types of evaluation: external appearance evaluation, which judges the look of the tea leaves, and internal quality evaluation, which evaluates the properties of the tea leaves (aroma, color, flavor) when steeped in hot water. In the external appearance evaluation, the factors to be taken into consideration are the color and luster of the leaves, their shape, and plucking quality. In the photos below, the leaves on the left are nice and green and finely twisted, though a little crushed; the leaves in the middle seem to lack color, being a kind of bamboo-like green, though they are well twisted; and the leaves on the right are a little blackish, flat, and with prominent stems. In terms of the evaluation test, the ones on the left are judged to be the best, followed by those in the middle and then those on the right. For a layman, though, it is rather difficult to tell the difference. In the internal quality evaluation, the aroma test involves putting the leaf in a teacup, pouring in hot water, then scooping out the used leaf using a tool like a small flat net with a handle and directly smelling the fragrance. While some leaves had a refreshing aroma, others had a strong and distinct fragrance apparent to even a layman like me. Regardless of whether people might like or dislike such distinctive aromas, apparently they receive low marks in conventional evaluation. Next there was a test of color and taste. 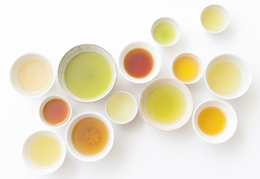 To test color, tea is poured through a strainer to evaluate the color. To be honest, although I did receive an explanation of what is the best color, it was difficult to understand. In contrast, the test of taste was relatively easy. When I selected a tea that seemed most tasty, the professionals agreed with my choice. From the experience, I realized that the aroma and taste tests are easier for laymen to understand than the visual test. When I sipped them, even teas that in the above evaluation had a strong aroma and received a low rating for color seemed surprisingly tasty. Yabukita is an outstanding variety of Japanese tea that accounts for about 70% of national cultivation area. Since the tea plant is grown not from seeds but from cuttings, most Japanese tea is a clone of the excellent Yabukita cultivar. To an extent, therefore, the quality, plant size, and way of growing are uniform. 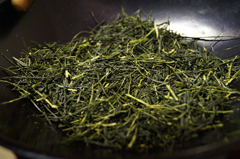 The sencha evaluation is based on the Yabukita variety. Rather than selecting distinctive tea, evaluation apparently follows a method of looking for defects and deducting marks accordingly. As a result, I was told, unavoidably the top ranks are mostly occupied by teas that do outstandingly well all-round on the Yabukita scale. In recent years, though, there seem to have been more moves to give higher marks to distinctive products as well. 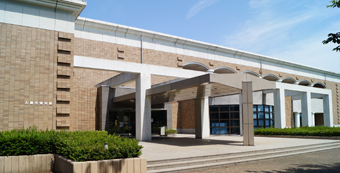 Iruma City Museum is a unique museum with tea as its theme. It was there that I learned the following basic information about tea. The tree plant belongs to the Camellia genus of the Theaceae family. 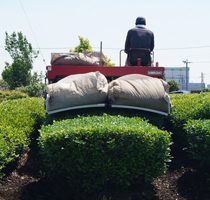 Since it is an evergreen shrub originally indigenous to the subtropical zone, it does not like cold or dry conditions. The tree plant prefers warm and rainy places with good drainage. The Sayama tea-producing area is the northernmost region where tea can be grown economically and in large quantities. 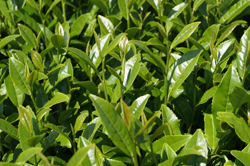 Sayama tea is produced in the cities of Iruma, Sayama, and Tokorozawa and their surroundings. This region consists of the Musashino Plateau, formed by the accumulation of layers of volcanic ash spewed from Mount Fuji and elsewhere atop an alluvial fan formed by sand and pebbles carried by the Tamagawa river from its upper reaches. Since it has a relatively heavy rainfall and good drainage, the Musashino Plateau is suitable for growing tea. 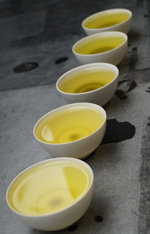 Generally speaking, there are three types of tea consumed in the world: green tea, which is produced by heating leaves immediately after they have been plucked to halt the functioning of oxidation enzymes (nonfermented); black tea, which is completely fermented; and in between, oolong tea, which is semifermented. Tea includes catechins, which have antioxidant, antivirus, and anticancer effects. In particular, there are a lot of catechins in green tea, which is produced by stopping catechin oxidation by heating. Green tea also includes vitamin C. It is for this reason that green tea is said to have health benefits. Historically, different ways of drinking tea were transmitted from China to Japan on three occasions. In about the year 800, during the Chinese Tang dynasty (the Heian period in Japan, 794–1185), Japanese envoys to China brought back information about drinking tea boiled in a kettle (senjicha). Later, around the thirteenth century, during the Song dynasty (Kamakura period, 1185–1333), Zen priests and others introduced the custom of drinking matcha (tencha). And then around the seventeenth century, during the Ming dynasty (Edo period, 1603–1868), again it was Zen priests who brought over the custom of drinking tea made in a teapot (encha). Interestingly, while some of these ways of drinking tea have disappeared in China, they are all still alive and well in Japan. 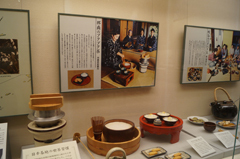 Iruma City Museum has displays about not only the history of Sayama tea but also the history of Japanese tea in general and of the world’s teas. 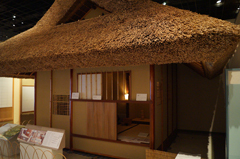 There are also exhibits relating to unusual tea-drinking customs that still exist in Japan and a replica of the teahouse built inside Osaka Castle by the tea master Sen no Rikyu (1522–91), which is a precious exhibit. I visited Mr. Masahiro Okutomi of Okutomi-en, a tea farm in Sayama that cultivates, produces, and sells Sayama tea, and observed the tea-manufacturing process. 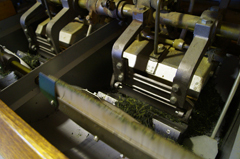 (1) First, tea leaves that have been harvested in the tea fields are loaded from a container onto a conveyor and sent to a steam machine. 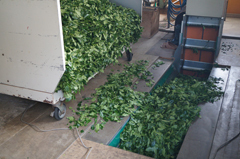 (3) After the steaming, the moist leaves are sent to a rough rolling machine. In the interior of the box-shaped machine, the leaves are kneaded by rounded and slightly open metal hands to squeeze out the moisture, and hot air is blown to help dry them. Even after the completion of this rough rolling machine process, though, the leaves are still quite moist. 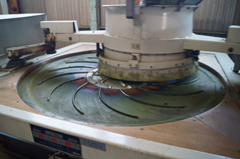 (4) In the next process, a middle rolling machine is used to further knead the leaves. By kneading them, the moisture in the leaves and stems is spread out evenly. No drying is conducted at this stage. 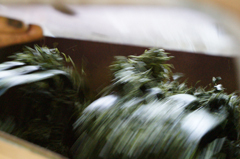 (5) Finally, after a further process of kneading and drying, the leaves are sent to a fine rolling machine, where, while moving back and forth, they are kneaded and dried on a heated board to create slender and twisted aracha (half-processed tea leaves). This aracha is then stored as it is, with only those leaves to be sold being dried by heating before going onto store shelves. 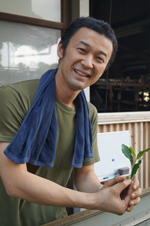 Mr. Okutomi looked so busy dashing around his tea factory, I felt very sorry to have to interrupt his work. “Can I ask you just a couple of questions?” I asked. Stopping in his tracks, he replied to them cheerfully. First, I asked him what the attractions of Sayama tea were for a producer. Second, I asked Mr. Okutomi about his prospects and ambitions as a Sayama tea producer. 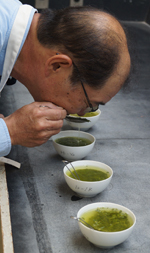 Every year the Nihoncha Instructor Association, which engages in activities to popularize Japanese tea, holds a contest to present the Japanese Tea Awards. The competition also has its sights on popularizing Japanese tea among young people and overseas. Unlike the conventional evaluation method of pouring hot water on tea leaves and then deducting points depending on defects, the evaluation at this contest focuses on ways of making tasty tea that satisfies consumers. In terms of producing tea that has high average marks and consistency in any situation, the conventional evaluation method is the correct one. But in terms of finding new enthusiasts of Japanese tea and opening new markets, like wine and sake, it is important also to take note of the pleasure to be derived from differences in region, producer, and variety of tea. During my research, I frequently heard the term “single origin.” I imagine that this term refers not to tasty tea that is average and safe but to tea that has a flavor and uniqueness that can only be created by a certain region, farm, or producer. Maybe Sayama tea, which prides itself in having as many flavors as the number of tea farms there, can drive this trend forward. With that hunch in mind, I headed back to Tokyo.